With its 62 suites Kapama River Lodge is the largest lodge in the private greater Kruger reserves – this makes it ideally suited to groups and incentives, whilst still retaining intimate spaces for individuals! 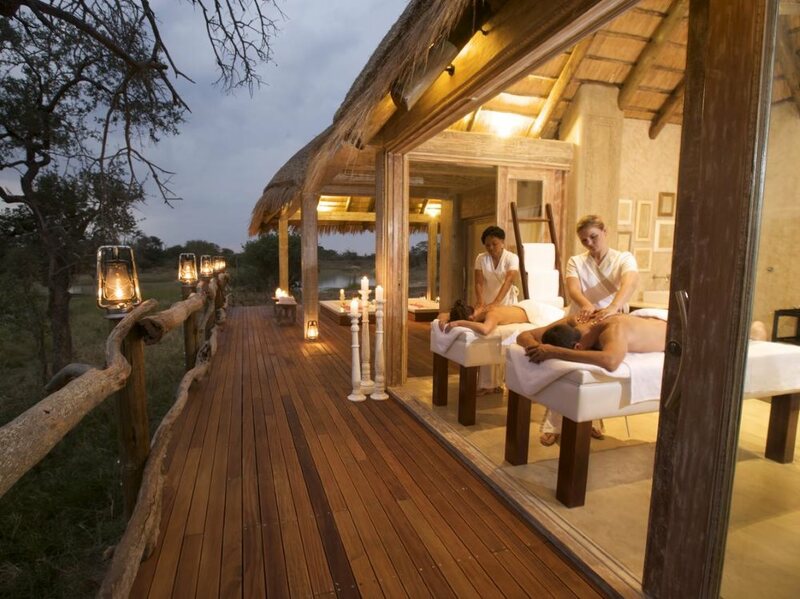 The superb Wellness Centre here is a major drawcard for River Lodge – it’s arguably the best value for money safari spa experience on offer in the country! Take advantage of some of the more unusual activities on offer here – such as elephant interactions or hot air ballooning over the surrounding lowveld! Excellent and reliably consistent game viewing aided by very good rangers and trackers – the wildlife experience at Kapama won’t disappoint! perhaps the highlight of Kapama River Lodge for many guests is the stunning Wellness Centre – a sophisticated Spa facility which includes 6 gorgeous treatment rooms and a stunning lap pool overlooking the riverbed! Within the expansive Kapama reserve, 13 000 hectares of savannah and riverine forest that’s renowned for its high density of big game, lies Kapama River Lodge. This is by far the largest of the 4 lodges that makes up the Kapama portfolio – in fact with 62 luxurious suites it has more the feel of a small luxury resort or hotel than a typical bush lodge. This makes it suitable for travellers looking for a stylish and luxurious property with more facilities (especially the superb Spa!) and perhaps more of a “buzz” than smaller lodges – it also makes it a perfect option for corporate groups or management breakaways. Kapama River Lodge comprises of 62 suites which are positioned along a bend of the seasonal Kapama River – the accommodation includes 40 Standard Suites, 16 Spa Suites, 4 Family Suites and 2 luxurious Royal Suites. 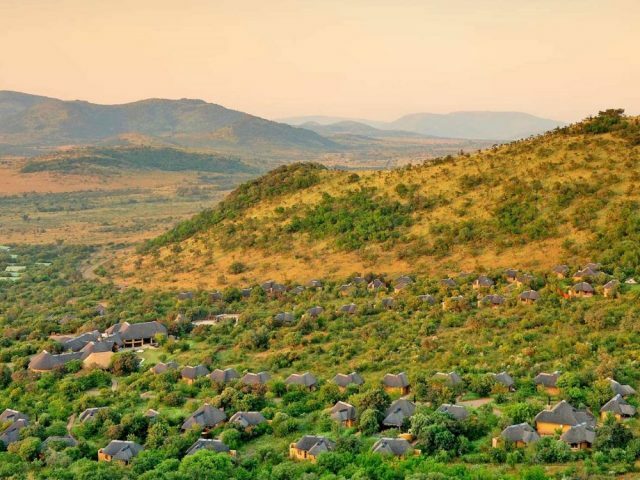 The spacious air-conditioned Standard Suites are decorated to reflect old Africa and have uninterrupted views over the reserve from private decks, where you can sit with an ice cold beer and be entertained by the sights and sounds of the bushveld! The Spa Suites though are our personal favourites - positioned a little way from the lodge to ensure additional privacy and proximity to the Spa where you can enjoy unique African spa treatments. These have a sleeker and more contemporary design style, featuring expansive glass doors and frameless windows which allow unobstructed bush views, including from the bathroom. Located with the Spa Suites, the Family Suites have triple balconies, along with spacious bedrooms (with a lounge area that can accommodate an additional two beds for children) - these rooms are also ideal for couples wanting the additional space and comfort of an oversized bedroom. Taking luxury game lodge accommodation a step further, River Lodge finally has two Royal Suites that offer substantial space and include a separate lounge and extended balcony furnished with recliner couches. The en-suite bathroom has a bath and a dual shower overlooking the surrounding bush – what could be better than soaking in the bath while watching the wildlife pass by! 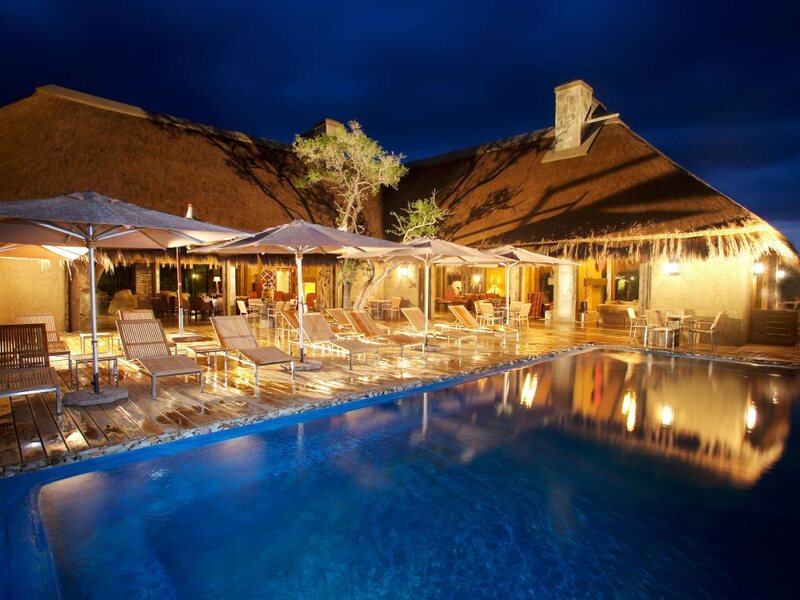 The main lodge features intimate lounges with African artefacts and glass stack doors that open onto the rim-flow pool to create an al fresco experience, with recliners under umbrellas that beckon you to enjoy shady relaxation around the pool – which is also a prime vantage point for game viewing! The long, L-shaped lounge and bar, under double-volume thatch, follow the line of the pool to create an airy but cosy atmosphere - and in winter, a double-sided fireplace provides additional warmth. 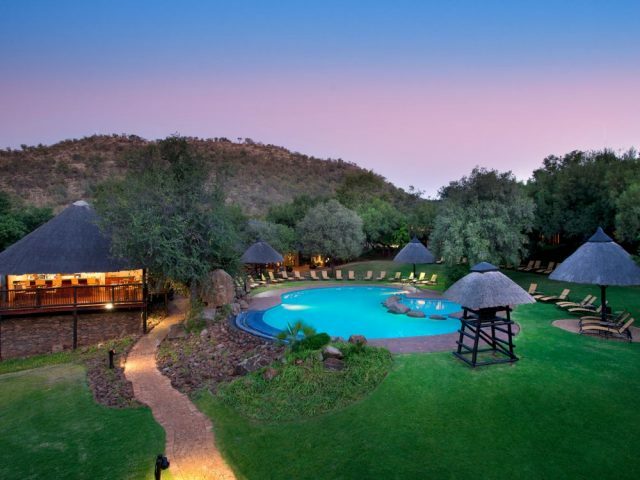 A small, permanent waterhole lies just beyond the perimeter of the lodge and attracts various species, so viewing members of the Big Five – cocktail in hand – is not unusual from here! The lodge offers different dining venues: evening meals are often enjoyed seated around a roaring fire in the Rhino Boma, while romantic dining is epitomised by dinner set in the dry riverbed under a star-studded sky! The Siyatla Lounge is purpose-built as an enclosed dining area, where breakfasts and lunches are enjoyed, including a bar and lounge with two large fireplaces, while glass stack doors open up the lounge to the surrounding bushveld – it’s also perfect for functions and conferences. But perhaps the highlight of Kapama River Lodge for many guests is the stunning Wellness Centre – a sophisticated Spa facility which includes 6 gorgeous treatment rooms and a stunning lap pool overlooking the riverbed. Dermalogica and Matisse products are used and there is an innovative range of treatments infused with a unique African flavour. And if that all sounds a bit too laid-back and pampering, then fitness masochists (sorry, enthusiasts!) can enjoy making use of the state-of-the-art mini-gym! It might not offer the feel of a typical game lodge, but guests at Kapama River Lodge definitely get to enjoy an excellent game viewing experience! Twice-daily game drives with a qualified and passionate ranger and expert tracker reveal Africa’s big game in all their glory, and you’ll get to share in their many secrets and stories of the bush – it makes for unforgettable wildlife encounters! You can expect to encounter a diverse range of animals on open 4x4 vehicles - it's a thrilling experience to find yourself surrounded by elephants or to spot a pride of lions with cubs! While seeing big game is always exhilarating, there are many other smaller species that are also captivating, and birding enthusiasts will be delighted. As darkness falls, the nocturnal animals come out and the skilled tracker will scan the landscape using a spotlight which illuminates animals’ eyes – and you will notice a completely different variety of species! An interesting excursion on offer is to enjoy lovely views of the area from the air in a hot air balloon – with a glass of bubbly in your hand, what could be better! Kapama also offers you an unique and unforgettable African wildlife experience with the chance to interact with a herd of rescued elephants that now call Camp Jabulani home!